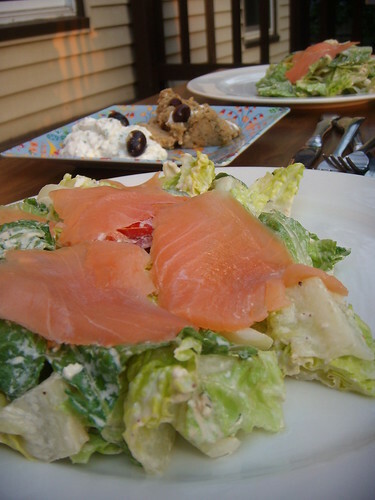 smoked salmon garlic dill balsamic salad, originally uploaded by aarn! +10th July, 2008+. salad had onions, dried cranberries, feta, and tomatoes, tossed in some of the garlic dill balsamic mayonnaise, diluted by the moisture on the romaine, topped with some slabs of smoked salmon. roasted eggplant dip and tzatziki made by theo at zoe's of cambridge, served with some grilled pitas.